Woke up early and couldn’t sleep (credit it to the coffee ice cream sundae I had yesterday…I have no caffeine tolerance anymore), so I got up and pulled the fabric from the dryer.Â It feels wonderful!Â It has softened up dramatically (more than the sample did) and while there is a faint hairiness from the mohair, it has that distinctive cashmere softness as well.Â I may buy more of this yarn!Â It’s only about $35/lb which is incredibly cheap for something that’s 70% cashmere. Bottom: before wet-finishing. Top: after wet-finishing. Neatly folded and ready to go! You can see quite distinctly in the last photo that one of the warp skeins came out darker than the others (every third stripe is slightly darker than the others).Â Fortunately, I had the foresight to wind the warp sections in sequence, skein 1 followed by skein2 followed by skein 3, so what might have become an unsightly blotch became a mildly interesting sequence of darker stripes.Â It adds an interesting variation to the fabric. I love dyeing my own yarns!Â The results are rarely quite as even as with commercially dyed yarns, but to my mind the slight variations add to the character of the fabric.Â And my results are still quite even, enough so that they don’t scream “homemade” (as opposed to “handmade”). I had approximately 13% shrinkage in the width (23″ in the reed shrank to 20″ after wet-finishing) and 8% shrinkage in the length (27 feet on the loom went to just shy of 25 feet wet-finished).Â This corresponded almost precisely to my sample, so I’m glad I did one. Next on my plate: lay out the pattern pieces on the finished fabric, to see how much I will really need.Â If I have a little extra warp, I will weave a 3/1 herringbone twill and use the black-dominant side up to make a mostly-black lapel for the coat.Â I think it will be prettier that way – less “busy” and with greater visual interest. 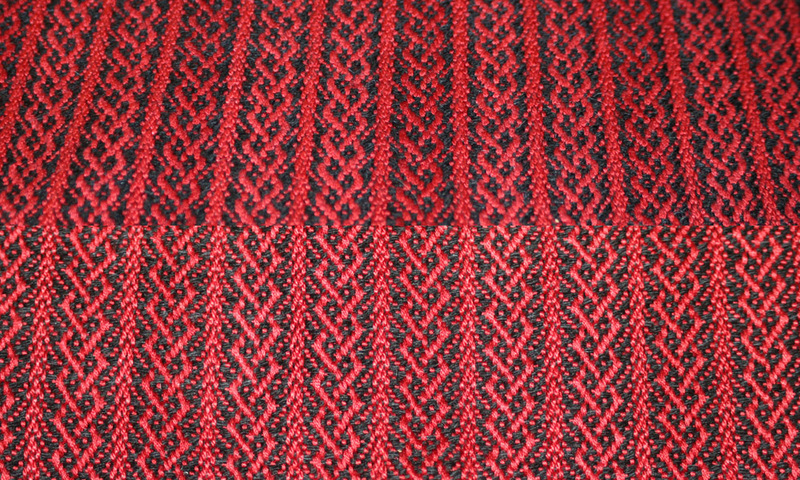 For the next 9 yards, I will switch to the second dyelot of weft yarn, and use the resulting yarn for the back of the coat.Â I figure that if I switch dyelots between front and back, nobody will notice – but if I have two slightly different dyelots in the front, it will beÂ obvious! Off to work…it is still crazy at work, though I think I have figured out a political solution to the ongoing war between two of our departments.Â So hopefully things will be looking up soon. That is gorgeous — thanks for the tip about winding warps with hand dyed yarn. You’re right, it looks planned (and terrific). My minimum hard press is to do face, back, then face again. When I feel the fabric, I don’t want to feel individual threads, but a ‘whole cloth’. When my studio assistant was pressing the worsted samples for Magic, she questioned why I kept pressing beyond a/b/a. When I told her to feel the end that had been pressed 7 times as opposed to the rest which had only been done 6 times, she could feel the difference, too. For such a large project, you might talk to a dry cleaner (one that actually *does* the pressing) and see if they know what a hard press is, and how much it would cost for your fabric. If you press the back side as well as the front, the fabric will be slightly thinner, which will probably make sewing it (especially where there are four layers of cloth – sleeve, collar etc.) easier as there will be less bulk. You should feel really good about this cloth—most wonderful. Perhaps I will even get to see and fell it in person. I have much appreciated following your process. 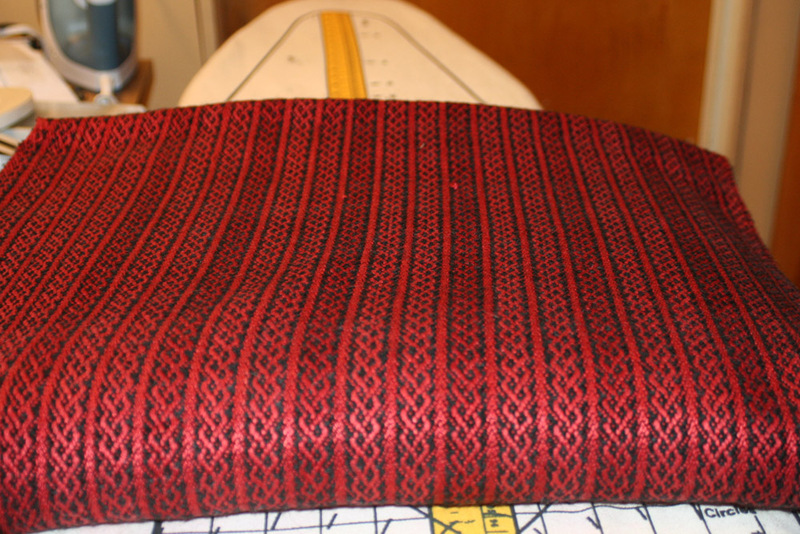 Wow – the cloth is gorgeous! And you are a fast weaver!!! Look forward to seeing the coat! The color and shine are wonderful! I’ve known Tien since she first began complex weaving. I sold her her first 16S loom not so long ago. 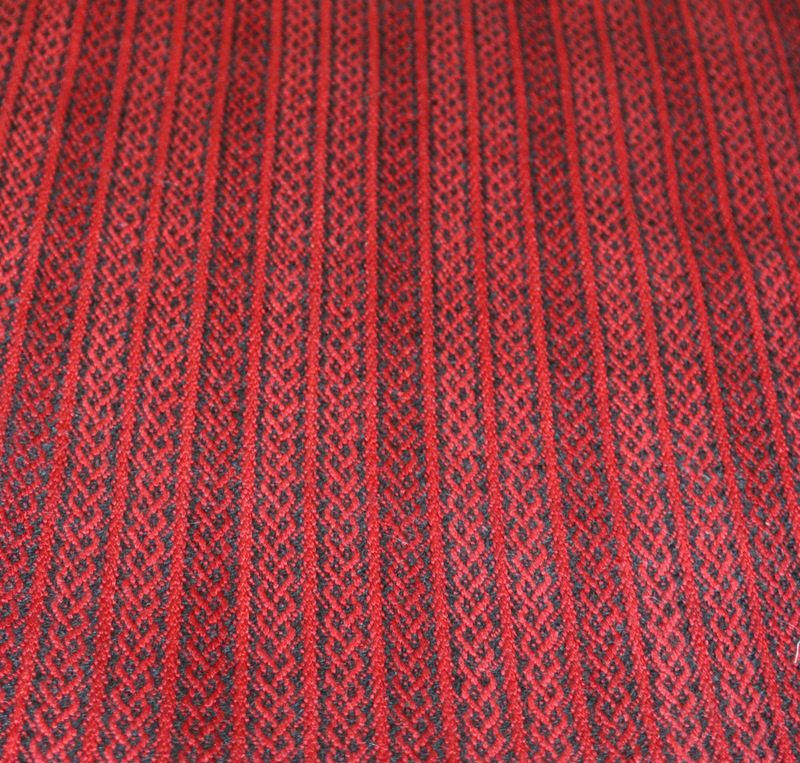 It’s a wonderful testament that a weaver who appreciates the craft can turn out this quality work by caring and thinking deeply about what she does. Take it as an inspiration, all y’all. Make discoveries. Take a little risk. I know Tien does.